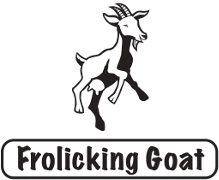 The signature range of Frolicking Goat cheeses are made in the style of those found in the Poitou-Charentes region in France. This is the central to the west and Loire Valley region of France. The cheeses generally grow a Geotrichum Candidum mould rather than Penicillium Candidum found on cheeses such as camembert. Geotrichum ripens the cheese giving it a rich flavour and aroma. Penicillium Candidum gives goat cheese a sharper flavour which we don’t always find to be desirable. The strain of Geotrichum we have chosen gives more fruity notes than a “barnyardy” flavour. This range of cheeses is basically the same cheese. The different surface areas of the different shaped cheeses lead to different flavour profiles during the ripening. Some of the cheeses are covered in ash which leads to a milder flavour in the ripening of the cheese.